The global water cycle is a fundamental component of the climate system. Water is cycled between the oceans, the atmosphere and the land surface (Figure 7.5). 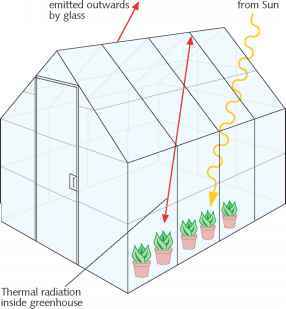 Through evaporation and condensation it provides the main means whereby energy is transferred to the atmosphere and within it. Water is essential to all forms of life; the main reason for the wide range of life forms, both plant and animal, on the Earth is the extremely wide range of variation in the availability of water. In wet tropical forests, the jungle teems with life of enormous variety. In drier regions sparse vegetation exists, of a kind that can survive for long periods with the minimum of water; animals there are also well adapted to dry conditions. Water is also a key substance for humankind; we need to drink it, we need it for the production of food, for health and hygiene, for industry and transport. Humans have learnt that the ways of providing for livelihood can be adapted to a wide variety of circumstances regarding water supply except, perhaps, for the completely dry desert. Water availability for domestic, industrial and agricultural use averaged per capita in different countries varies from less than 100 m3 (22 000 imperial gallons) per year to over 100 000 m3 (22 million imperial gallons)27 - although quoting average numbers of that kind hides the enormous disparity between those in very poor areas who may walk many hours each day to fetch a few gallons and many in the developed world who have access to virtually unlimited supplies at the turn of a tap. Increases in freshwater use are driven by changes in population, lifestyle, economy, technology and most particularly by demand for food which drives irrigated agriculture. During the last 50 years water use worldwide has grown over threefold (Figure 7.6); it now amounts to about 10% of the estimated global total of the river and groundwater flow from land to sea (Figure 7.5). Two-thirds of human water use is currently for agriculture, much of it for irrigation; about a quarter is used by industry; only 10% or so is used domestically. The demand is so great in some river basins, for instance the Rio Grande and the Colorado in North America, that almost no water from them reaches the sea. Increasingly, water stored over hundreds or thousands of years in underground aquifers is being tapped for current use and there are now many places in the world where groundwater is being used much faster than it is being replenished; every year the water has to be extracted from deeper levels. For instance, over more than half the land area of the United States over a quarter of the groundwater withdrawn is not replenished and around Beijing in China the water table is falling by 2 m a year as groundwater is pumped out. These are just examples of greatly increased vulnerability regarding water supplies that arise from rapid growth of demand. 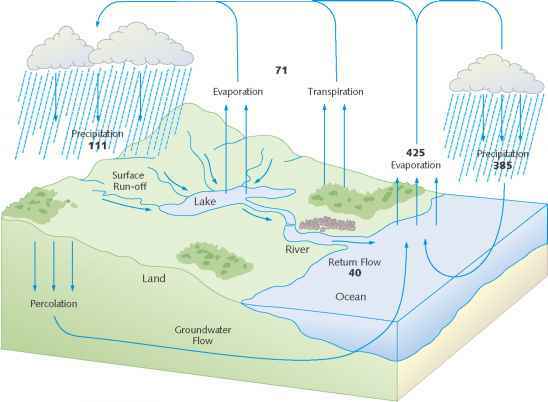 Figure 7.5 The global water cycle (in thousands of cubic kilometres per year), showing the key processes of evaporation, precipitation, transport as vapour by atmospheric movements and transport from the land to the oceans by run-off or groundwater flow. Mediterranean region, the Near East, South Asia, northern China, Australia, USA, Mexico, northeast Brazil and the western coast of South America. This is illustrated in Figure 7.7 where examples are given of some of the current vulnerabilities of fresh water resources and their management. The number living in water-stressed countries is projected to rise steeply in coming decades even without taking into account any effect on water supplies due to climate change. 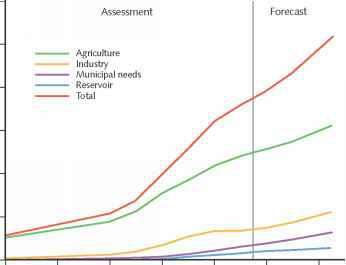 Figure 7.6 Global water withdrawal for different purposes, 1900-95, and projected to the year 2025 in cubic kilometres per year. Losses from reservoirs are also included. As some water withdrawn is reused, the total water consumption amounts to about 60% of the total water withdrawal.